Sun. #2 is HERE. To help the website out please subscribe to Mistah MegaManFan so we can reach 1,000! If you're a gamer you'll enjoy the content. Also don't miss WWE Raw highlight videos later tonight! With the cheap plugs out of the way here's Monday's latest wrestling news. 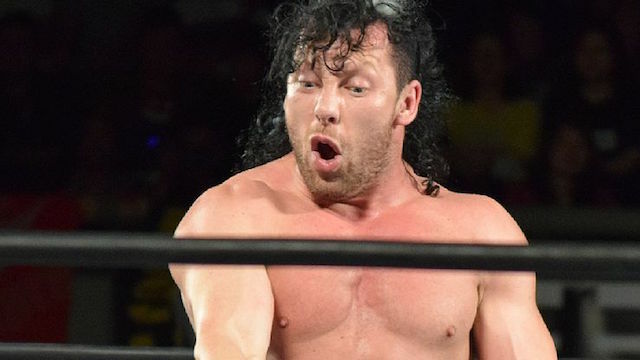 Via Tokyo Sport's website Kenny Omega has announced he's leaving New Japan Pro Wrestling: "There is no real place for me to fit, so it's best for me not to be in (NJPW). I can't be there working under Tanahashi. I don't think he's surpassed me, don't think he's better. If we can, I want to face him again. But I need time away, and not just from New Japan." It wouldn't be surprising if he ended up with All Elite Wrestling since that's where his friends are now, but as we've been reporting all weekend WWE has "a very good offer" on the table trying to woo Omega to come back (he was once there in developmental). In addition KUSHIDA says he's leaving at the end of January. * Jeff Hardy makes his way to the ring for a match and is attacked from behind by Samoa Joe. A match is made between them for later tonight. The video below should serve as a primer for which All Elite Wrestling social media accounts are authentic and which ones are bogus. In this recap Bruce Prichard explains how the late Test (Andrew Martin) got his WWE name: "The version was that since he was a roadie for Motley Crue, we actually had him travel for them a little bit and we made him go out on the microphone and the only thing he would go out and say was, 'Test... test.' So, Shawn Michaels said, 'Well, he's going out there and letting everybody know what his name is.' He became Test out of that." * Dominic Dijakovic defeated Shane Thorn. * Lacey Evans defeated Xia Li. * Brennan Williams defeated Kona Reeves. * EC3, Keith Lee, & Matt Riddle defeated Bobby Fish, Roderick Strong, & Kyle O'Riley. After the match, EC3 did a send-off speech that implied that NXT is now in Riddle and Lee's hands. He left Riddle and Lee to celebrate in the ring. * Aleister Black defeated Adam Cole. * Rhea Ripley defeated Bianca Belair, Kairi Sane, and Aliyah to retain the NXT UK Championship. * Velveteen Dream and Ricochet defeated DIY (Johnny Gargano & Tomasso Ciampa). * There was an entertaining spot at the end of the main event that saw a huge brawl break out between Velveteen Dream, Aleister Black, EC3, Keith Lee, Matt Riddle, Ricochet, all the members of Undisputed Era, Ciampa, and Gargano. Adam Cole was left in the ring by himself and the six babyfaces took turns delivering their finishing moves to him. Dream was last, delivering his Hogan-like Atomic Leg Drop to Cole. Aleister Black, EC3, Keith Lee, Matt Riddle, and Ricochet oversold him colliding with the ring, acting like they collapsed from the leg drop's force when he hit the mat. Indeed very silly, but entertaining nevertheless. Dream cut a promo to send the crowd home happy. In this interview Ric Flair talks about 'Mean' Gene Okerlund: "I've been reluctant to talk to a lot of people because I'm not sure if that's appropriate yet-for me to start talking about all the fun we've had. Bubba's known me forever, he knows that whatever I have done in my life, I've had fun. Let's just say I've had more fun on strictly a social level. We contributed to each other's health issues, let's put it like that. But we had - God - so much fun. And not just fun, but quality time. And even when I wasn't with Gene, if he was at a Comic Con or a signing, or whatever, we just always got together. WrestleMania, the most important thing for me, aside from the stuff with my daughter as of recent, was Wendy and I finding Gene and enjoying each other socially. Tremendous relationship, great guy." Here Brian Cage gives his thoughts on All Elite Wrestling: "I think it's great what they're doing. I thought All In was one of the coolest moments in wrestling. AEW, New Japan, Impact, ROH, WWE... there's so many awesome places to work right now including independents all over the world. The more places there are to work, the more opportunities for the boys... It's not like WWE's boom in the 1980s, but I think professional wrestling, as a whole, is definitely on a good upswing." A new Jordynne Grace interview is available below. Highlights from the David Arquette vs. Jocephus hair vs. hair match are below. * Dan McGee pinned Sha Samuels after a flying cross body. * Sammii Jayne pinned YUU in a Queen of the Ring tournament semi-final tournament match after Rev Pro Women's champion Zoe Lucas interfered and hit YUU with the title belt. * Debbie Keitel pinned Chardonnay in a Queen of the Ring tournament semi-final tournament match. * David Starr & Rob Lias & Great O-Khar & Josh Bodom beat El Phantasmo & MK McKinnan & Shigehiro Irie & The O.J.M.O when O-Khan pinned McKinnan after Lord Gideon Grey hit McKinnan with his cane. * Chris Ridgeway beat Kurtis Chapman by submission. * KellyAnne and Zan Phoenix beat RPW Women's Champion Zoe Lucas and Laura DiMatteo when Lucas attacked DiMatteo then left the match allowing Phoenix to get the pin. * Queen of the Ring tournament final: Sammii Jayne pinned Debbie Keitel after a couple big knee strikes to win the tournament. * The main event was made an official title match for the British Heavyweight Title. * PAC won by disqualification when British Heavyweight Champion Zack Sabre, Jr. knocked the referee into the ropes as PAC was going for the Black Arrow. Zack attacked PAC after the match and tried to destroy PAC's arm but Will Ospreay made the save. In case you were wondering Rich Swann won the X Division title at Homecoming last night and Taya Valkyrie won the Knockouts Title. A large group of Smash Wrestling talent were involved in a major car accident when the car they were traveling in from Montreal slid on the ice and smacked into a guardrail. Puf, Kevin Bennett, Kevin Blackwood, and Daniel Garcia were in the car. Garcia and Blackwood both suffered broken bones and required surgery, while Bennett and Puf were treated for minor injuries. The group in the car have also worked for Empire State Wrestling and Limitless Wrestling. Our thoughts are with them all. During Homecoming last night Impact Wrestling announced they'll be on Pursuit AND on Twitch starting January 11th. That should be VERY good news for those who don't have Pursuit Channel on their cable or satellite provider. Speaking of Impact and Homecoming highlight videos can be found below.